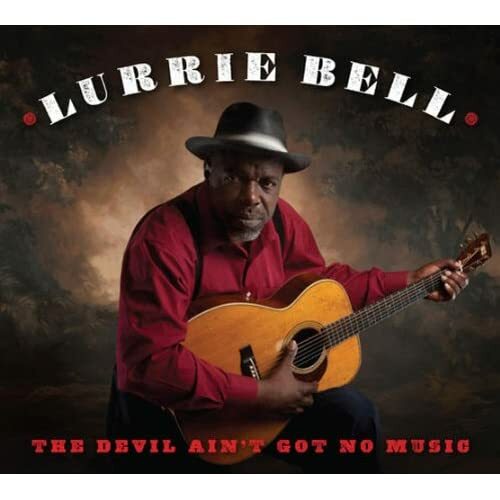 “As long as there is a black church there will be blues musicians,” says Sterling Plumpp’s introductory quote to Lurrie Bell’s The Devil Ain’t Got No Music, and it’s apt indeed. It’s Bell’s first all-gospel recording, but were it not for the lyrics, this collection would unquestionably be filed under blues. The blues and the black church have a long and rich relationship, of course. Widely considered ‘the devil’s music,’ the blues were banned in many a religious household, and blues musicians were almost universally thought to be headed straight to hell. Yet musically, gospel and blues are two sides of the same coin, one sacred, one profane, one promising eternal pleasure in the afterlife, the other celebrating more immediate, and earthier, pleasures, but both seeking musical salvation of sorts. Bell’s blues credentials are impeccable; son of Chicago harmonica legend Carey Bell, he literally grew up in the presence of giants. A prodigy on guitar, he seemed poised for greatness before personal demons sidelined him for a while. In recent years he’s reemerged, stronger and better than ever, as one of the most intense and creative guitarists and soulful vocalists around. What’s not as widely known, though, is that Bell also spent formative years in the deep south, where he, too, was forbidden to play the blues. Living with his grandparents – his grandfather was a preacher - he discovered a musical outlet in gospel, and he continues to find solace in spiritual music. Joining Bell to help out is another blues artist with strong roots in the church – Joe Louis Walker -- who contributes slide guitar on a pair along with vocal testifyin’ and handclaps. Also on hand are the likes of producer Matthew Skoller, a supremely accomplished harmonica player, with Billy Branch taking over on one, and Kenny ‘Beedy Eyes’ Smith on drums and percussion. Elsewhere there’s upright bass and additional guitar, but overall a stark and stripped-down sound predominates, placing Bell’s gruffly sweet vocals firmly up front – this is most emphatically not a project designed to display dazzling instrumental dexterity. But while instrumentation may be sparsely applied, it’s all done with impeccable taste, and Bell shows a master’s hand at arranging things, whether it’s the ticky-ticky percussion on opener “Swing Low” or Bell’s own exquisitely refined finger-picking on solo performances of Muddy Water’s rare “Why Don’t You Live So God Can Use You” and the stark, brooding “Death Don’t Have No Mercy” that bookends the collection. Individual elements are employed for maximum effect, with simple and direct expression the goal - performances are never allowed to overwhelm Bell’s deeply heartfelt expressions of faith. Bell has always been a more soulful and melodic singer than the typical blues shouter, but here he’s quite simply magnificent, delivering every line with unwavering conviction. There’s a resonant dignity and gravitas in his voice, and he’s utterly without artifice- his vocals virtually personify honesty and truth, and there’s genuine grace in every word he sings. Material ranges from the traditional, including familiar fare like “It’s A Blessing” and a spine-tingling rendition of Thomas A. Dorsey’s “Peace In The Valley,” mixed with covers of Tom Waits (“Way Down In The Hole”), James Taylor (“Lo And Behold”), with Walker contributing his own “I’ll Get To Heaven On My Own.” Like the blues, gospel encompasses a wide range of human emotion, with looming eternity adding an extra layer of import – the stakes, in short, are rather high – and Bell is equally effective whether the mood is raucously exuberant or serenely contemplative. Whether one’s a believer or not, Bell’s steadfast faith is more than sufficient – regardless of the message, it’s hard to imagine anyone remaining unmoved by the stately yet full-of-life performances herein. This project is clearly and inescapably a labor of love, recorded not to entertain, not to sell records, but because the songs touch Bell’s own soul in the most profound way possible. The results are utterly sublime, and The Devil Ain’t Got No Music is nothing short of an out-and-out masterpiece!